After this section there is no doubt you will have a complete understanding of our monetary system and how it impacts the global financial system. To invest wisely, you must understand what money really is, how it works and who may be manipulating markets and why. HAPPENING TO YOUR BANK ACCOUNT? or that the whole subject is just too boring to pay attention to. After all, how much can the value of your bank account really swing up and down? The answer is a lot. 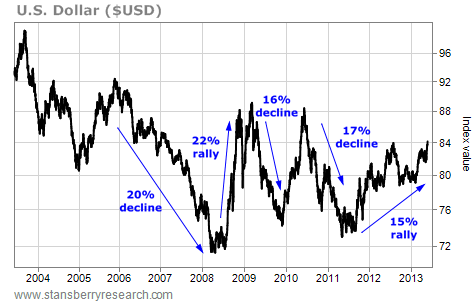 Below is a 10-year chart of the U.S. dollar index. It measures the dollar's value against a basket of foreign currencies. It's the value of our bank accounts in terms of global purchasing power. As you can see, it's bouncing up and down with tremendous volatility. Big changes in value are taking place in the span of months not years. This video is pretty much the accelerated crash course on our monetary system. Despite the overtone of this video expressed by the Ludwig Von Mises organization, in which we should re-adopt the gold standard, this video explains the role the Fed plays in the daily manipulation of our currency. Now you understand the basics, all kinds of thoughts should be circulating about how you can protect, grow your money and hedge your finances against the Fed's actions. Please continue on to the next video. By the time you finish this section should should be incited toward revolution. This video is a little bit of an overlap but it explains fractional banking in more detail and how this practice contributes to hyper-inflation. It's explained that fractional reserves have a 9 to one ratio. There are many banks that have a fractional ratio no less than 30 and upwards of 120. The video also explains the globalization of monetary control and how fiscal enslavement is orchestrated by the bankers for those who aren't part of the "one percent". Towards the end of the presentation comedian George Carlin sums it up perfectly. This video explains how this global monetary system of control was established and who established it. The date of this production is 1996. The same elements that were a concern back then such as inflation, unemployment, etc., are the same concerns today. That tells you that moments of prosperity and recessions are cyclical. Anytime there is a pattern tells me that this is not coincidental and someone is making a lot of money from taking various positions in the market that THEY are manipulating. What is a "petro dollar"? What is its purpose? This video will hopefully educate and open your eyes to the reality of what's happening with the US currency and how it differs from other currencies throughout the world? Information is power and this information should empower you to think about how you can both protect your current wealth and retirement and how you profit from the impending chain of global events surrounding the US and China. to the moon last year? On February 7, Global Economy and Development at Brookings hosted a discussion on the renminbi's (RMB) prospects as an international currency and its implications from two perspectives—the balance and sustainability of China's own economic development and the associated implications for the global monetary system. Rep. Alan Grayson questions the FED Inspector General Elizabeth Coleman where $9 TRILLION dollars went to. Just listen to the back-stepping and insanity of the situation. She honestly has no clue. Most people get fired for not balancing a cash register. Listen to the answer which is even more shocking. This piece was on MSNBC about the Federal Reserves practices coming to light. Poor Ron Paul. His battle to get an audit and oversight committee established for the Federal Reserve is futile. Just because this video discusses events that potentially led to the financial crisis in 2008, don't think the same shenanigans aren't being perpetrated today. Learn about four men who brought down the global economy: a billionaire mortgage-seller who fooled millions; a high-rolling banker with a fatal weakness; a ferocious Wall Street predator; and the power behind the throne. This video paints the Rockefeller family as the American industrial, political and banking family that made one of the world's largest fortunes in the oil business during the late 19th and early 20th centuries. The presentation lightly touches on the family's long association with and financial interest in the Chase Manhattan Bank, now part of JPMorgan Chase. They are generally seen as one of the most powerful families in the history of the United States. This guy sounds like a complete nerd. If you can get the image out of your head of a chubby wearing black horn rimmed glasses with white tape on the temple and a pocket protector and listen. What he says is absolutely correct. Bloomberg News reports G-8 Loses Clout; Further Analysis and Discussion with Dan Katzive of Credit Suisse about the US losing its reserve currency status and perhaps a new US currency being introduced. Listen to this because it will happen sooner than later and since it effects us all, we need to be positioned to offset any potential damage that these fools will cause. The petro dollar, reserve currency and how treasuries relate. The guy is on the money. Now you know what the REAL purpose of treasuries and the corrupt system behind it. money supply and yet inflation is never a problem. Find out why countries keep buying U.S. debt and why the US dollar is the world's currency. Notice the number of US bases in the Middle Eastern region. He can't pronounce "renminbi" but he knows what he's talking about. I first met Doug Casey at a poker game in New Orleans. Although this was a casual game among friends, it was clear that Doug was a brilliant player. He was also wonderful company. He let the youngest player and the first to bust, buy back in with the charm of a five-star concierge. And he shared many extraordinary stories about his life in finance and his travels around the world. Earlier this month, as Cyprus was appealing for a financial bailout, Doug published the following interview describing how the failings that undermined that nation's banking system infect banks around the world, including ours in the United States. Doug's analysis of modern banking is exactly the kind of work I love to share. Doug never holds back his opinions. And while they challenge popular and conventional wisdom, they're always insightful and thought-provoking. Louis : Doug, there is considerable disagreement over the significance of the Cyprus crisis. A lot of people are saying that it's just a flash in the pan. Cyprus is a small country, far off, and doesn't really matter. Other people are saying it's very significant. The European Central Bank (ECB) took unprecedented steps. What do you think? Doug : I think this could be the spark that ignites the keg of dynamite under the current financial system. All banks, all around the world, are bankrupt and have been for years. That's because all the world's banks run on a fractional reserve basis. Louis : I know what you mean, but we should spell that out. By law and backed with government guarantees, banks only have to keep a tiny fraction of the money people deposit on hand. They lend out the vast bulk of it, and in even in good times, they could not return all depositors' money at once, since loans cannot be called in instantaneously, and most would be defaulted on if they were. In bad times, the charade is even hollower... since many loans that banks are currently owed will never ever get paid. Doug : Yes, and they are all in that position. It was more serious in Cyprus because that economy is very leveraged to finance. In other words, Cyprus was a banking epicenter for Europe. It was easier to make deposits – there were fewer questions asked – making banking the major business of the country. But I think the trouble will spread from there. It could spread to Luxembourg or Malta next. Both are at least as leveraged to the financial sector as Cyprus. And from there... who knows? Louis : Why would it spread? Cyprus was said to be particularly vulnerable because of its strong Greek connections; Cypriot banks had bought of lot Greek debt. Would people in Luxembourg be as exposed? Doug : All banks are in effect creatures of the state at this point. They all own a lot of government bonds, which are considered the most secure form of capital. Of course, that's the opposite of the truth; all these governments are bankrupt as well. The Greek government is just more overtly bankrupt than most. Actually, we should take a minute here to discuss what a properly run banking system looks like. Historically, banks offered two types of accounts: demand deposits and time deposits. Demand deposits are what we call "checking accounts" today, but the original idea was that you'd pay your bank to store your money securely, and you had the right to "demand" your deposit back immediately, and to transfer funds via check. The idea of time deposits, which became savings accounts, was that the bank would pay you interest when you deposited your money with them for a specific period of time. That's why it's called a "time" deposit; you lent the bank your money for a given time, as did other depositors, and the banks would always know how much money they could lend out – at higher interest rates. Furthermore, loans made against time deposits were always short term, and also self-liquidating, against receivables, or excess inventory, for instance. There were no government guarantees for deposits back then. Bankers needed to capitalize their businesses with their own funds, and if they miscalculated, they were personally liable – and often did go bankrupt themselves if they made too many bad loans. Depositors naturally avoided banks known to make risky or illiquid loans. Banks competed to be known as the most prudent and solvent. Both lenders and depositors were cautious. Before the early 20th century, people might well have laughed at today's depositors of Cypriot banks. If they were foolish enough to put their money in banks that made such stupid loans, they only get what they deserve. Louis : Our friend Rick Rule likes to say that the idea that the state can guarantee everyone's deposits is just another unaffordable, unbacked social promise of the 20th century – just another example of living beyond our means. Doug : Yes. I don't think people understand this. People don't have a clue, do they? People read editorials by Paul Krugman and neither laugh nor roll their eyes. It's like they're all on Prozac. Louis : The nature of real banking is not something they teach in school anymore, that's for sure. Doug : Then it's worth repeating. The distinction between time and demand deposits is critical. They are completely different, actually unrelated, businesses. Today, the distinction has been totally lost. But it's much worse, since central banks have allowed the problem to compound to the nth degree. Sound banks never made what we call "consumer loans" today because there is no guarantee, no collateral. Banks in the past made only short-term commercial loans that were fully covered by the value of the assets being financed. You never had to rely on the good faith of the borrower. You simply facilitated short-term – short-term – liquidity. The idea of a 30-year, a 20-year, or even a 10- or five-year mortgage was anathema to sound bankers. A building-and-loan society might grant a five-year mortgage to one of its members, with a very significant down payment. That's because even though it's an asset class with value, real estate is illiquid. Forget about credit cards. Forget about car loans. If you want a car, save up for one. It's funny, actually. Car loans started out with a one-year term and a big down stroke. Then, they went to two years. Now, they're five or more, when people don't just lease. So even the family car has gone from a minor asset to a long-term liability. Subprime loans would have been completely unthinkable in the past. Louis : Many people might say that credit that tight would be impractical today. Doug : Many people don't like the idea of having to live within their means. They feel they have a right to have whatever they want, now. That's why the average American has essentially zero net assets. If everyone had to pay cash for everything, our whole society – from individuals on the lower rungs to big corporations to the state itself – would be much, much wealthier. We would not be, individually and as a society, one paycheck from being forced to live in a cardboard box under an overpass. Louis : Perhaps so, but again, many people think modern high finance is not just normal, but necessary for civilization today. Big Business requires Big Credit. Doug : Nonsense. The way you become wealthy is by producing more than you consume, and saving the difference. We don't need a fractional reserve banking system, we don't need government guarantees, and we certainly don't need to use government IOUs backed by nothing masquerading as money. I understand something like 20% of the U.S. economy is financial in nature. It's ludicrous; millions of people spending billions of dollars bundling, swapping, and repackaging imaginary assets. I'd guess that in a free-market economy, banking and related industries would amount to about 2%, a tenth as much. Money is essentially just a medium of exchange and a store of value; it's problematic when it becomes a gigantic industry. All these people who spend their days gambling with ledger entries would have to go out and find something productive to do. Louis : Get real jobs. Doug : Exactly. The whole banking business is corrupt from top to bottom today. Part of the problem is that banks are no longer financed by the individuals who start them, putting their personal net worth on the line. Now, they are all publicly traded entities – just like all brokerages – playing with Other People's Money. Management has no incentive to do anything but pad their wallets, so they pay themselves gigantic salaries and bonuses, and give themselves options. These people aren't shepherding their money and that of clients they know personally. They've got zero skin in the game. This is true all over the world, not just in the U.S. and Europe. All these banks are going to blow up, and not just in far-off, little countries. Louis : It's interesting that a part of the basis for your negative prognosis for the global financial network is rooted in human psychology – the perverse incentives of playing with Other People's Money, exacerbated by government guarantees and banks mistakenly viewing government bonds as safe investments. Doug : Imagine you're a smart, young trader working for Goldman, Deutsche Bank, or one of these big financial institutions. It's actually in your interest to make incredibly crazy bets. You can win billions of dollars if red comes up on the financial roulette wheel. If that happens, you get a multimillion-dollar bonus. You win. But if your bet doesn't work out, what then? The bank loses a few billion dollars, and you just go work for another bank, with more experience on your résumé. And you do the same thing over again. Louis : So what does one do with hundreds of trillions of dollars in derivatives? Doug : I don't know, and neither does anyone else. Not even Warren Buffett. Nobody can possibly keep track of quadrillions of dollars of derivatives. It's a daisy chain in which nobody can really know who is creditworthy. It's impossible to assess the real counterparty risk. All these thousands of traders sitting at computer banks, second-guessing markets; it's actually quite insane. I can hear them on the phone: "Hello, New York? Buy! Hello, Tokyo? Buy! Hello, London? New York and Tokyo are buying. Sell." It's an immense waste of productive manpower, them and the divisions of highly paid lawyers, accountants, and administrators behind them. Little of this would exist in a free-market world without central banks spewing trillions of currency units out every year to support governments. Of course, a gigantic financial industry arose to deal with it. In any event, the people who today imagine they run the show may have put a finger in a dike, but it's all going to come to very bad end. One of the interesting things about this Cyprus thing is that, according to the numbers I hear bandied around, the Russians are supposed to have had somewhere in between $30 billion and $60 billion in Cyprus. Who knows what the real facts are, because you can't trust what's reported in the press... but I've been to Cyprus – both Northern Cyprus and the Republic of Cyprus. It's true that the place is overrun with Russians and Russian money. Now, you've got to figure that if you're a Russian oligarch with a lot more than 100,000 euros in a bank and the bank tells you you're not getting it back – are you going to just sit on your hands and do nothing? I hate to say what I would do if I were a crony capitalist... but if I were, I might just send several very burly men with cold steel strapped under their arms to talk to the banker in question and make it very clear to him that I will get my money back. Louis : I sure wouldn't want to sell life insurance to Cypriot bankers right now – nor ECB bureaucrats, for that matter. Doug : I've read that just before this crisis hit the papers, billions and billions of Russian money found its way out of Cyprus. That's supposed to be why the Russians were raising hell at one point, and now they've gone quiet. My guess is that the Cypriots heard from their oligarch depositors or prudently gave them advance warning, and decided that the most important thing was getting that money back to them. But everyone else – people who don't have squads of hit men – gets screwed. So much for Cyprus. I guess they'll go back to shepherding, growing olives, serving ouzo to the occasional hippie tourist, or whatever subsistence-level activities they did before becoming a banking haven, because no one anywhere in the world is going to deposit any money in Cyprus for a very long time. Cypriot businesses can't even get money out of the bank to pay their bills. They've just been hit with the financial equivalent of a nuclear bomb. On the other hand, Cyprus has a little stock market that's probably at a washout bottom. Five years ago, at the top of the bubble, its index peaked at around 3,300. Now, it's about 100. That's one of the worst crashes in history, anywhere. I suspect that there are some very viable businesses available – companies selling for a tiny fraction of book. A smart speculator would be on a plane to start sorting through the wreckage. I think fortunes could be made there, especially since it now has capital controls. Which, incidentally, will become common everywhere. The more important takeaway from all this is that no bank in the world is safe at this point. They are all in exactly the position as Cypriot banks were before their crash. Louis : In today's world, you almost have to have some money in the bank, if only to pay bills with. Doug : Just keep enough cash for a few months' expenses. A bigger crash is coming, there's absolutely no question about that in my mind. The only question is whether it happens later this week, or next week, or next month, or a few months from now. I don't know, but it won't be long before it all starts unraveling. I cannot stress strongly enough that I think anyone who chooses to keep a significant amount of money in any bank is patently stupid. I mean that in the technical sense of stupidity – being an unwitting tendency towards self-destruction. And I don't just mean European banks, though they are certainly closer to the edge. But it's true of Japanese banks... it's true of American banks... Chinese banks. It's true of all of them. Louis : So where do you keep your money? Doug : There is only one answer, as far as I'm concerned: Buy gold. One of the most important financial truths I know is that gold is the only financial asset that is not simultaneously somebody else's liability. This is not an academic distinction. It never was, but the urgency of it is much more pressing today. Louis : Do you really think the Cyprus crisis could spark the unwinding of the bankruptcy of the rest of the global financial system? Is this the first domino? Doug : Well, it could be. But I have to tell you, I'm here in Punta del Este in Uruguay, and I just had lunch with some Spanish real estate developers. They have quite substantial assets, actually, and they didn't seem worried at all. I was surprised. These are rich, sophisticated people. But they seemed like most U.S. tax slaves, who think [Federal Reserve Chairman Ben] Bernanke cares about them and can kiss everything and make it better. These guys see problems, but they think [International Monetary Fund chief] Christine Lagarde and her fellow bureaucrats are going to sort everything out. They see that real estate prices are off 50% in Spain and are thinking that this is the time to buy. I think it's way too early, of course. Better to wait for massive riots. A lot of that property is going to catch fire from Molotov cocktails. Louis : That's pretty striking. Of all Europeans, it's the Spanish and Italians you might expect to be most worried. And these Spanish guys didn't seem worried at all? Doug : They were pretty sanguine. If I were in Europe, I'd run to my bank first thing. But I haven't heard of any bank runs in Europe. When it does happen, however, government printing presses will be running at even higher capacities than now. And people will have the problem of what to do with all that cash. A lot – like my Spanish friends I had lunch with today – are viewing real estate as a place to park wealth that can't just dry up and blow away. That's true, of course. But property has significant carrying costs, and prices can plummet if there are no buyers. There's a huge liquidity risk associated with getting overweight in real estate. That brings me back to gold again. Louis : Some people are saying that increased distrust of banks in Europe might actually be bearish for gold prices. Europeans needing to move large amounts of cash will buy dollars, and many people are still programmed to sell gold when the dollar rises. Doug : That's plausible. But I just don't see gold going down in a big way at this point. I really don't. I just met a fellow in Cafayate [Argentina] last week – a very interesting guy who runs a gold exploration project in south Kivu province in the [Democratic Republic of the Congo]. He says that there are Chinese all over Kivu, buying gold from the artisanal miners, on the order of 40,000-50,000 ounces per month. And they're paying London spot prices. Apparently, this is under the auspices of the Chinese government itself, as it allows them to dump dollars off the market and cart home the gold. The Chinese are stuck with far more dollars than they can get rid of without provoking a panic, so this makes perfect sense. It's quite clever of them, actually. And this is just one story, from one place. So no, I don't see gold going down. Louis : OK. We already know that you say to buy gold for prudence. Are there any other investment implications? Doug : Well, I mentioned the Cyprus stock market. That's the sort of thing I might do if I were younger – hop on a plane tomorrow and go check out the opportunities for crisis investing at a time when there are almost no other buyers. More generally, I just have to say again that the trailing half of the storm is coming, and it's going to be much worse than 2008. Investors who don't rig for stormy weather will go down with their ships. You know, another thing my Spanish friends said was that more and more people they know are thinking of moving to South America. It's much cheaper, there's less crime, less regulation, less taxation, and more opportunity. I think other Europeans – all Europeans – should think of following suit. Louis : And folks in the U.S.? Doug : Them too. Things look calmer in the U.S. right now. But the government in the land that was once America is now much more powerful, aggressive, arrogant, grasping, and ruthless than the governments in Europe. I'd say to all people, all around the world, that the failure of Cyprus is like the failure of the Credit-Anstalt Bank in Austria that failed in 1931 and set off the banking crisis that followed the stock market crash of 1929, and then the Great Depression. You need to plan for further crisis and the deepening of the Greater Depression that has already started – and start taking concrete steps now to implement that plan. I can't say exactly when the next big step down is coming, but it is. Louis : OK, Doug. Well... another cheerful conversation – but an important one, I think. Doug : You're all very welcome.